A few matchdays ago, the Championship looked poised for one of the craziest promotion races in recent memory, but with a little help this weekend from their friends, it is Watford and (all but officially) Bournemouth who will be bathing in the glory (and approximately $185 million) of the Premier League next season. Neither the Hornets nor the Cherries were actually able to fully celebrate their new celebrity status right after wins that ultimately would do the deal for them. Watford played the early match last Saturday, and then saw Norwich City draw and Middlesbrough stunningly fall at Fulham for their place to become official. Bournemouth, which will be in England's top flight for the first time in the club's 116-year history, didn't play until Monday, when it beat Bolton, 3-0. Portsmouth has been the South Coast club most notably in the news for its financial problems and descent down the English soccer pyramid, but Bournemouth suffered very significant troubles itself late last decade, with the club nearly going insolvent in 2008. The Cherries were handed a 10-point deduction in that season, when they were relegated to League 2 (the country's fourth division), and then received a massive 17-point deduction the following season, where, under the leadership of current manager Eddie Howe, they barely escaped being relegated out of the Football League altogether. Since then, they've fashioned a remarkable ascent. The following season, Howe led the club to promotion to League 1. He then left to manage Burnley, but came back two seasons later and immediately guided the Cherries to a promotion to the Championship. Bournemouth finished 10th last season before exploding this season, scoring a league-high 95 goals thus far with a pleasing style that also has seen the Cherries lead the Championship in shots attempted, possession and passes completed. The club's Goldsands Stadium seats about 12,000, and will easily be the smallest venue in the Premier League next season. Watford has its own interesting series of stories since the last time the club was in Premier League eight seasons ago. 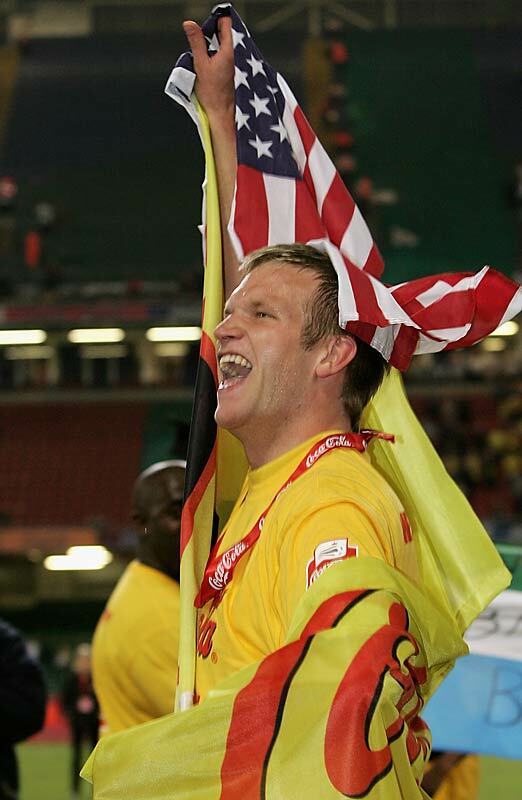 The club is probably known best stateside as the former home of U.S. international center back Jay Demerit, who scored the eventual game-winning goal in the 2006 promotion playoff final against Leeds United, but it has a bit of history at this level–along with a lot of recent newsmaking. 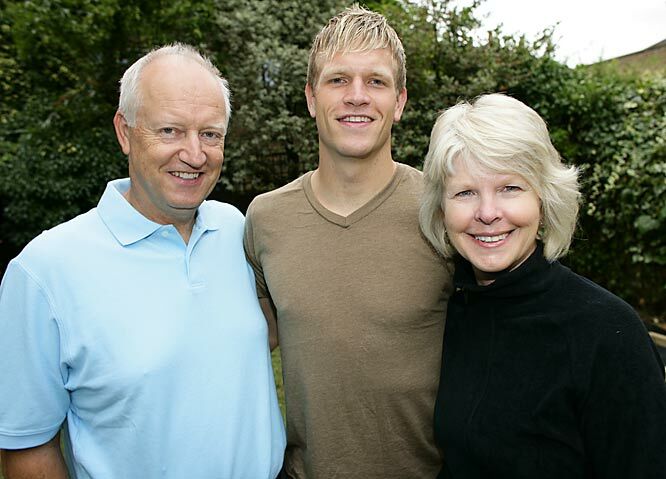 Green Bay, Wisc., native Jay DeMerit (6) is probably the unlikeliest of all American players to be pursuing his dream in the English Premier League, one of the world's top soccer leagues. The 26-year-old defender has become a key player at Watford despite never having played for a U.S. team at any level. DeMerit took a chance three years ago after a successful college career and a brief stay in American amateur soccer. He moved to England with $1,800 in his bank account, looking for tryouts at any level. After stints at a couple of lower-division clubs (and painting houses to make ends meet), DeMerit got his break with suburban London's Watford, a second-division club. It was a Hollywood moment, almost the soccer version of "Rocky." In the League Championship playoffs in May, DeMerit headed in what would prove to be the decisive goal against Leeds United. 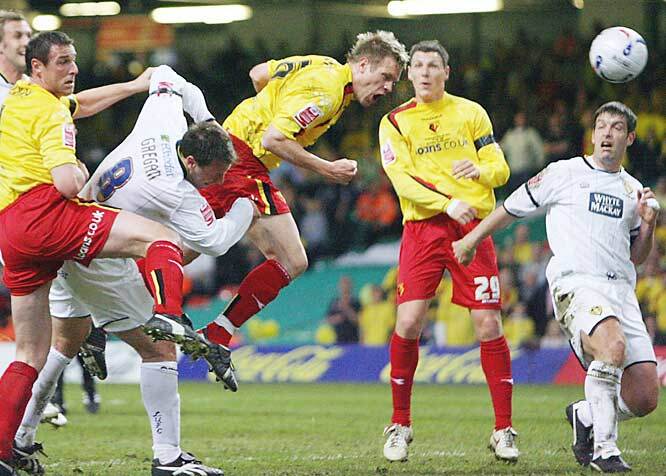 Watford won the match and, with it, promotion to the Premier League for the 2006-07 season, turning the American defender into an overnight celebrity. In two years' time, DeMerit went from sharing a friend's attic bedroom and living off $70 a week to defending Manchester United players and meeting Watford's president, Elton John. "It was kind of surreal," DeMerit says of meeting the pop icon. "We talked about Brett Favre, of all things." DeMerit's heroics and hard play have made him an improbable fan favorite at Watford's Vicarage Road stadium. Hornets supporters routinely chant "U-S-A! U-S-A!" and "Jaaaaay, Jay DeMerit! Jay-Jay-Jay from the USA!" 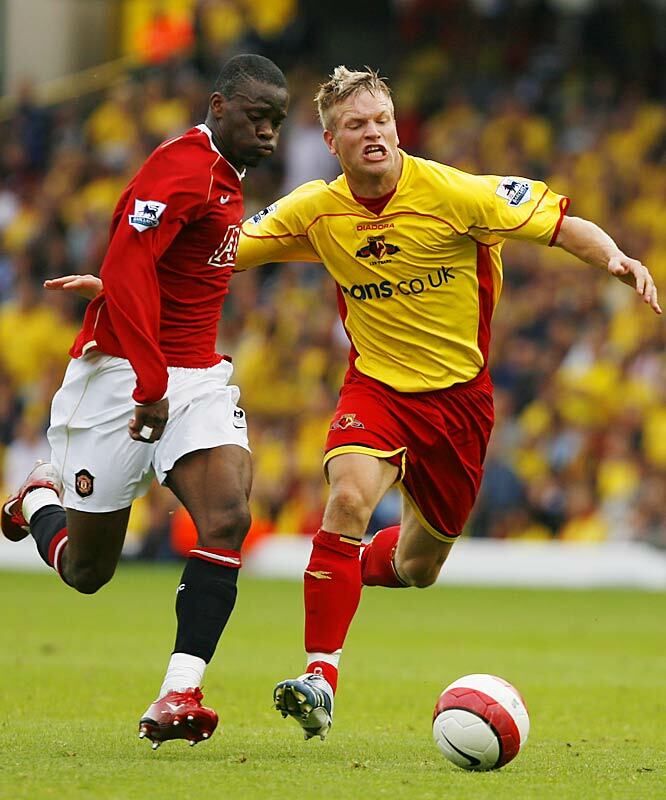 As a defender in the Premiership, DeMerit must mark some of the best forwards in the game, including Arsenal's Thierry Henry, Chelsea's Andriy Shevchenko and Man Utd's Wayne Rooney and Louis Saha (pictured at left). "I like the challenge of going up against some of the best players in the world each week," he says. "If I can hold my own, it's only going to make me better." 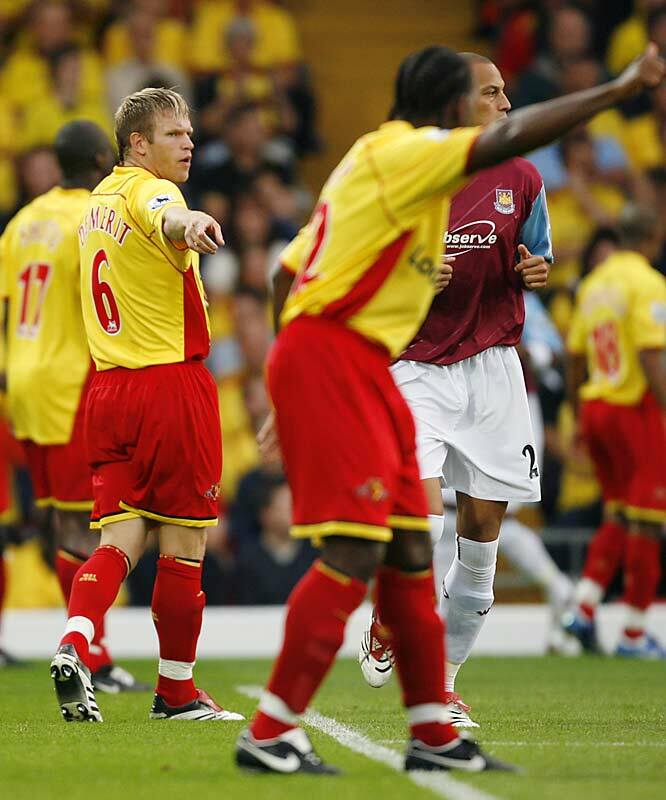 When DeMerit signed with Watford, his contract paid him $45,000 a year, but his play since has earned him a three-year deal that pays him 10 times that for the '06-07 season. He and girlfriend Katherine Carter recently purchased a flat in London's hip Camden Town neighborhood. DeMerit is still a work in progress at the top-flight professional level, but his parents, John and Karen, have been supportive every step of the way and often come to England to see their son compete. With his hard-nosed style, DeMerit has earned the respect of his teammates. "Jay's got total respect from all the players here," says fellow Watford defender and Scotland international Malky Mackay. "He's always had the physical attributes, but his development has come in deciding when to challenge, when to drop off and when to play the pass." DeMerit is one of a record 13 Americans currently playing in the English Premier League, but unlike most of them, he has never played for the U.S. national team. Watford manager Adrian Boothroyd boldly predicts that DeMerit one day will become the U.S. captain. "My goal is to keep progressing," DeMerit says, "whether that means being on the [U.S.] national team, continuing to move higher with Watford or, if not, then moving somewhere else. There's no reason I can't continue to set higher goals and get to the pinnacle of my profession." Watford actually finished second in the old first division in the 1982-83 season, but its last two trips to England's highest level have ended after just one season. Soon after the club was relegated again in 2007, a parade of managers began that includes some very notable names. Aidy Boothroyd got the Hornets back into the promotion playoffs the following season, but they were rubbed out 6-1 on aggregate by Hull City. He was soon replaced by Brendan Rodgers–yes, the current Liverpool manager– in Rodgers's managerial debut. Once Rodgers left for Reading, Watford hired Malky Mackay, who subsequently went to Cardiff City, got that club promoted, and then made news for a series of racist and misogynist private emails. Next up was Sean Dyche, the man who subsequently got Burnley promoted and is fighting the good fight there to try to escape instant relegation this season. Then Gianfranco Zola took the helm, and guided Watford to the 2013 promotion final with the help of one of the sport's most dramatic endings, when Watford keeper Miguel Almunia saved an injury-time penalty against Leicester that prompted a counterattack, which ended with Troy Deeney's winner at the death. They then lost to Crystal Palace in the final, 1-0. That Watford side is also notable for being the trigger behind a rules change that significantly limited Football League clubs' ability to take on loans en masse from overseas after the Hornets were loaded up by sister club Udinese. That all seems like relative stability compared to this season, when the Hornets have had four managers on their way to promotion after finishing 13th last season. Beppe Sannino lasted just five matches, Oscar Garcia then resigned after four weeks for medical reasons. Billy McKinley was bumped up to replace Garcia, and then soon was replaced by former Chelsea defender Slaviša Jokanović, who guided the Hornets to English soccer's promised land. With the auto tickets now punched, the focus turns to the promotion playoff race, where six teams are still in the mix for the final Premier League spot for next season. Boro and Norwich City (which was relegated just last season) have clinched spots in the two-legged semifinals, and will be the three- and four-seed in some order, meaning both clubs will have the advantage of hosting the second leg. Fifth-place Ipswich (a nice story in its own right with McCarthy successfully guiding a club that effectively has had a $0 transfer budget for several seasons), needs just a draw (or even a one-goal loss and a one-goal Brentford win) to nab its spot. The final place currently is held by Derby County, which suffered promotion final heartbreak last season, where the Rams battered QPR but succumbed to Bobby Zamora's late winner. Thanks to their goal difference, they also basically need a draw, home to Reading. Should Ipswich or Derby slip up, upstart Brentford or Wolverhampton could advance with wins of their own. Has the price of English soccer just gone beyond crazy? Because of the massive money involved, the promotion playoff is billed as the richest game in world soccer, and it won't be getting smaller anytime soon. The Prem's new TV deal that will start in the 2016-17 season will grow revenues by another $3 billion or more. With the ever-growing gulf in cash between the Premier League and Championship, and more restrictive Financial Fair Play rules currently in place in the second division and below, you never know when you'll have your next chance for promotion. As Watford and Bournemouth have shown, nothing is guaranteed from one season to the next. Those two now know their fate, and one other lucky club will be coming up with them. For the other five contenders, and the 13 other clubs that will stay in the Championship with them, the battle for those three precious promotion tickets will be rejoined again in just three short months.